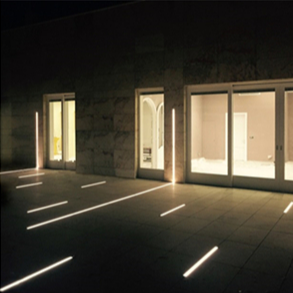 MAX Illumination has released a variety of LED Aluminum Profiles to illuminate as a special LED Strip Light project. It makes it possible to create many new possibilities. The length o LED Aluminum profiles extruded is from 50 cm to 250 cm which offer different packing standard. Moreover, you can customize the aluminum led light for your existing projection not only the length but also the wattage intensity per meter, we will assistant with you. 1.The aluminum material is a low density, lost cost and corrosion resistance so we could find the aluminum material used from bottle drink to the boats and aircraft. And, the aluminum has no aroma. 2.Our aluminum channel incorporate cooling parts which works as an integrated heat sink to dissipate heat form the LED strips. 3. The quality extruded aluminum profiles give unlimited solutions for novel lighting designs with LEDs. 50 customized extrusion aluminum can perfectly match with your design objectives LED lighting solution. 4. The extrusion aluminum profiles provides a wide range of mounting applications including wall, shop shelf, wardrobes, facades, drive way, buildings, restaurants, office, hotels. The special 45℃ angle could light up display goods that are widely used in the retail business and store shop. 5. The diffuser is available in clean, frosted and opal matt which provide a soft lighting source. 6. The aluminum led strip is a vital part of linear LED fixture as a lightweight and long lifespan house LED strip lighting of any color temperature, color and output. As a LED Aluminum Profiles manufacture offer a wide selection of LED strip allow you to create virtually any LED design without boundaries such as suspended LED aluminum extrusion, high output LED aluminum strip, recessed mounted LED aluminum strips and other custom applications. Contact with us, our engineered team would offer your more solutions.